Now in Mumbai carrotsare available cheap in market..Carrot is such a vegetable, you can consume it in so many forms. 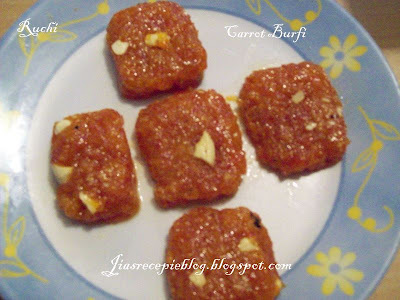 Carrot burfi, is one of the easiest and quickest sweet I have ever made. It is so tasty and nutritious at the same time. Like other sweets I didn’t add ghee much.Fast to cook and great to eat What better way to celebrate the beginning of the harvest season? Peel and grate the carrots. Grease a tray with ghee and keep aside. In a thick bottomed kadai, put one or two tablespoon ghee and fry the carrot gratings till it’s raw smell goes. Fry the cashew nuts also in a little ghee and keep aside. Heat a thick bottomed vessel or a non stick pan and add the grated carrot and milk to it and cook in medium flame. When carrots are almost cooked, add coconut adding little by little, stir until it dissolves . Melt sugar in sufficient water (for 1 cup sugar, ¼ cup water is sufficient) till it reaches one string consistency. Add the cooked carrots in sugar syrup. Add ghee now and then, till the mixture leaves the sides of the vessel. Add fried cashew nuts and powdered cardamom to this. Mix well and pour it in a greased plate. Cut into desired shape. And this is my entry for Festive Food: Makar Sankranti event hosted by Priti. Wishing you all a Happy Pongal! Parkave nanna iruku...Sapadanum pola iruku...Looking delicious..
Hi Jaishree, Wish you a happy Pongal. Carrot burfi looks totally yummy! yummmy cake.. i can keep on eating this forever. hehe. will try it. yummy yummy, looks so delicious; Vaai ooruthu!!! That looks yummy jaishree! Happy Pongal to you and your family! Reminds me of my carrot and pumpkin fudge. Looks very nice. Happy Pongal to you too Jaishree! 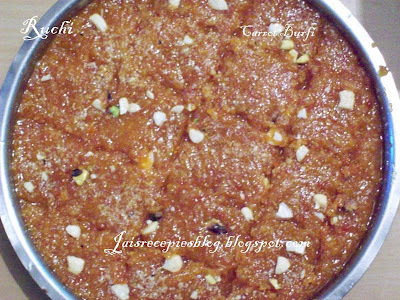 Carrot burfi sounds delicious! Nice to know you all like this burfi. and thank you all for your sweet comments:) wishing you all Happy Pongal. Wish You and family a prosperous and happy Pongal. mmm. burfi looks great! So festive. Happy Sankranthi! Wow wat a lovely feast...Happy pongal..